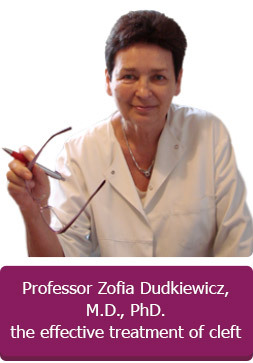 Scientific articles about the treatment of clefts written by Zofia Dudkiewicz published in peer-reviewed scientific journals – selected articles (author and co-author) . GASTROESOPHAGEAL REFLUX IN THE PIERRE ROBIN SEQUENCE. EARLY SURGICAL TREATMENT. NINETEEN YEARS OF CLINICAL EXPERIENCE IN EARLY ONE – STAGE REPAIR OF UCLP. UNIQUE METHOD OF TREATMENT OF THE ROBIN SEQUENCE. NEW APPROACH TO TREATMENT OF PIERRE – ROBIN SEQUENCE. MIDFACIAL GROWTH IN A CONSECUTIVE SERIES OF PREADOLESCENT CHILDREN WITH COMPLETE UNILATERAL CLEFT LIP AND PALATE FOLLOWING A ONE-STAGE SIMULTANEOUS REPAIR. TREATMENT OUTCOME AFTER ONE-STAGE REPAIR IN CHILDREN WITH COMPLETE UNILATERAL CLEFT LIP AND PALATE ASSESSED WITH THE GOSLON YARDSTICK. RELATION BETWEEN THE CONCENTRATION OF ZINC IN MATERNAL WHOLE BLOOD AND THE RISK OF AN INFANT BEING BORN WITH AN OROFACIAL CLEFT. COMPARISON OF DENTAL ARCH RELATIONSHIP IN CHILDREN WITH UNILATERAL CLEFT LIP AND PALATE FOLLOWING WARSAW (ONE-STAGE SIMULTANEOUS REPAIR) AND OSLO PROTOCOLS. Cleft Palate-Craniofac. J. 2009; 46: 648-653. NASOLABIAL ESTHETICS IN CHILDREN WITH COMPLETE UNILATERAL CLEFT LIP AND PALATE AFTER 1- VERSUS 3-STAGE TREATMENT PROTOCOLS. Oral Max Surg. 2009; 67:1661-1666. CRANIOFACIAL MORPHOLOGICAL OUTCOME FOLLOWING TREATMENT WITH THREE DIFFERENT SURGICAL PROTOCOLS FOR COMPLETE UNILATERAL CLEFT LIP AND PALATE: A PREMILINARY STUDY. J. Oral & Maxillofacial Surgery 2010; 39;122-128.